View of Churchill from grain elevator, 1931. My interest in books and my appreciation of the treasures they contain began while quite young. The adventure described in many of the boys’ books and magazines of the day led me to stories of the north. The famous painting of a sad-looking Henry Hudson being cast adrift in a row boat by his mutinous crew in the year 1611 touched my heart. And, so, I knew some things about Churchill long before I had the good fortune to go there for the first time in 1931one of the most interesting years in its modern history. The mouth of what was later the Churchill River was first visited by Europeans on 7 September, 1619 when the Danish navigator Jens Munck, along with a crew of sixty-five men, arrived aboard two small vessels, the Lamprey and Unicorn. Munck named the region “New Denmark” after his native land and called the estuary of the river Jens Munck’s Winter-Haven. Unfortunately, almost all of Munck’s crew perished during the ensuing winter and he sailed home the following July aboard the Unicorn with just two of his remaining sailors. In 1732 the Hudson’s Bay Company built Prince of Wales’ Fort at the mouth of the Churchill River to trade with inland Indians who brought their furs to the coast. After the destruction of Prince of Wales’ Fort in 1782 by the French captain La Perouse, a new trading post was erected about four miles south of the old fort on the same side of the river. Fort Churchill, or Churchill Post, was in operation well into the current century. It is clear that all these settlements were on the west side of the river. 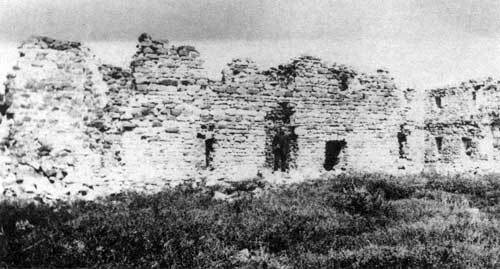 Ruins of Prince of Wales’ Fort, Churchill, circa 1930. Between these establishments, and just a mile or so south of the stone fort, lies Sloop Cove, a little embayment in the rocky coast that was used in the early days of the fur trade as an anchorage, and as a place where the ancient wooden vessels could be safely moored throughout the winter. Sloop Cove had been designated as a historic site and I was part of a crew sent to make a legal survey, setting out its boundaries. It contained one of the iron mooring rings that had been used to secureships for the winter, still firmly fixed in the rock. More importantly, it contained the names of ships and people who had been there, such as Captain Henry Middleton, with his ships Furnace and Discovery, and most important of all, the name of Samuel Hearne, the explorer, who was governor of the fort for many years. Following my graduation from the University of Manitoba in 1931, I was fortunate in finding permanent employment in the Surveys Branch of the Manitoba Government’s Department of Mines and Natural Resources. It involved land surveying, most frequently the laying out of small subdivisions in various parts of the province. In the mid-summer of 1931 the surveyor under whom I workedD. N. Sharpewas instructed to go to Churchill for the remainder of the season. There had been considerable pressure on the federal government around the turn of this century to build a port on Hudson Bay, which would provide a much shorter route for the shipment of grain to European ports. The York Factory area had been selected initially as the terminus. 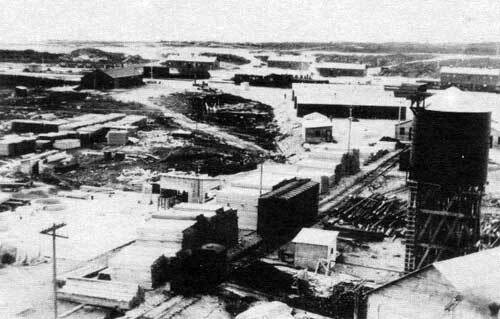 Construction of the Hudson Bay Railway from The Pas to Port Nelson was started in 1923. Concurrently, equipment and material were delivered there by sea for construction of the port. This involved considerable dredging in the adjacent shallow waters to provide sufficient depth of water for the draughts of sea-going vessels. Soon, the impossibility of keeping such passages open became apparent. The silt load of the swift waters of the Hayes and Nelson Rivers, was deposited as soon as the stream of fresh water struck the relatively calm waters of Hudson Bay. The consequent reduction of the current resulted in the deposition of its sediment at the mouth of the river. This, of course, completely disrupted the plans to build a railway terminus at Port Nelson. The only alternative was at Churchill, and the decision to move the port was quickly made in 1926. 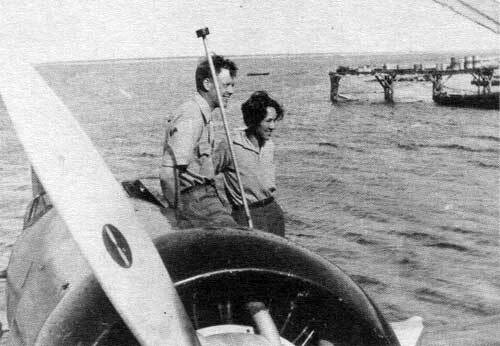 Useable equipment and supplies were shipped by sea to Churchill. Among such vessels used for this purpose were several little powered work boats normally used around the harbor. There was a story of one of the crew on a work boat who, unaccustomed to the open sea, became extremely seasick on the Hudson Bay’s rollers of the beam sea. His shipmates attempted to rouse him from his bunk to get him on deck, where the atmosphere was not so sickening. By this time, progress along the Hudson Bay Railway had proceeded as far as Kettle Rapids, when the change in direction of the railway was made from Port Nelson, as is obvious from a glance at any map of that area. In great consternation, new plans were made to build the port at Churchill. The construction of the grain elevator began on the east side of the river, which, of course, was dictated by the fact that the railway was located on that side. Construction of grain elevator at Churchill, September 1930. So tight was the new schedule that there was no time to construct the railway by the previously time-honored method of excavating the muskeg and backfilling with more stable materials. So the tracks were laid directly on the frozen muskeg in winter. Endless numbers of gravel trains were then carefully run onto the rather shaky trackage. The gravel cars were designed to open on the sides, and the gravel was poured directly upon the trackway, which was then lifted by track gangs. A repetition of this process a number of times resulted in a gravel road-bed six or eight feet thick which insulated the frozen muskeg through the short summers, minimizing its tendency to thaw and lose its bearing power. So, when our little survey party went north to Churchill, we rode upon one of the first few passenger cars that ran into the new station grounds at Churchill, with the roundhouse that grew inevitably at every divisional point. Primarily, our task was to lay out a subdivision of several hundred building lots immediately east of the station grounds. There were two other chaps in the party, Jack Edwards from Kemnay, Manitoba and John P. Norquay who was, I believe, a great grandson of Manitoba’s sixth premier. There could not have been two young men of more contrasting characters. Jack was a big strapping farm boy, pleasant, easy-going, phlegmatic, and a most willing worker. He was a good man to have around. John Norquay was rather slight of build, with a roundish face, peppered with freckles, and a shock of carroty red hair. His startling blue eyes missed little. He never complained about anything and upon one or two occasions he had some right to do so. He was greatly attached to a married sister who was, as I vaguely recollect, the wife of a Dr. Savage, who was then head of the Manitoba Agricultural College, which subsequently developed into the University of Manitoba campus. None of the three of us had any real cause for complaint, and I am certain none of us gave a moment’s thought to our good fortune in having employment on the verge of the Great Depression. Churchill, in those days, was a scene of great activity. The Winnipeg contractorCarter, Halls, Aldingerwas busy completing the construction of the 2.5 million bushel capacity grain elevator that was the port’s greatest facility for its overseas trade. This involved a work force of about 1,500 men. Immediately north of the elevator were the buildings accommodating the federal government’s Department of Railways and Canals that supervised construction of the elevator and the docking facilities. George Kydd was in charge of construction at the port. In addition, there were the establishments of the Royal Canadian Mounted Police, the Royal Canadian Signal Corps, banks, traders, a photographic store, along with the Hudson’s Bay Company’s store. The shift of activities from Fort Churchill on the west bank to the east side of the river had been completed, some of the buildings being hauled intact across the river-ice for less than $100. Construction at Churchill, July 1930. By far, the most imposing landmark on the Churchill horizon was the grain elevator which rose to a height exceeding 100 feet. Tracks had been laid out on a heavy gravel fill to feed grain trains into the elevator car by car. In those days, boxcars were used exclusively. A car was centred on the dumper, set over an enormous concrete bin, and tilted, first one end up, then the other. On the dumper, the car was securely clamped to the rails and tilted longitudinally. Simultaneously, a steel gate was swung through the car’s open doorway, to direct the grain from the upper end of the car out the door, preventing any of it from flowing into the lower end. The upper end of the car was then lowered, and the same process in reverse was used to empty the other end. The heavy gravel fill on which these tracks were placed extended beyond them for ten or fifteen feet to make a shoulder that was about the same height above the underlying ground surface. A little yard engine was used to make up trains in this yard, and I recall the brake who connected and disconnected the boxcars wore a black derby hat. To accommodate the work force, the contractors had erected a considerable number of long, low, wooden buildings that served as dormitories. These lay almost half a mile east of the elevator. Sanitary facilities were primitive, draining into an extensive depression intervening between the dormitories and the gravel fill surrounding the elevator. In time it developed into an extensive evaporative surface, known locally, but never mentioned in the tourist guide books, under the quaint but descriptive name of Excrement Lake. There was a shorter name that momentarily has slipped my mind. Another survey party was operating in the Churchill area that summer on a federal project that involved the mapping of the coastline, mainly west of the Churchill River around Button Bay. The black flies were ferocious that year. I saw one of their men so badly bitten that his neck was swollen out to his chin. Our survey of the subdivision near the station went ahead smoothly and with little interruption but for one incident. Parts of the area were covered with a few inches of standing water. To drain the water it was arranged with the C.N.R. to have a dragline dig a six foot deep ditch along the front of the subdivision adjacent to the station grounds. All went well until one of the little boulders normally encountered turned out to be about eight feet in diametermuch too big for the dragline to handle. We needed the dynamiter. Along came this happy little man with his bag of goodies who set out to break the boulder up into smaller pieces that the dragline could handle. His “goodies” turned out to be a package of dynamite sticks, some fuse wire, and some “mud,” as he called it. He laid half a dozen sticks on top of the boulder, twisted the fuse wire to connect them, and covered the whole with a slap of “mud:” He stepped back a few paces on the surface of the ground above the ditch to admire his handwork. Then he said, “You know, this is pretty old stuff. I think I’ll add a couple more.” Wherein he wired two more sticks to his pack, and added more mud, patting it smoothly and affectionately into place. Again he stood back ruminating. “Maybe it’ll take a couple more to bust a big rock like that.” So he slapped two sticks on it, and then we backed off while he lit the fuse. He came running up to us, puffing a little. We stood where we had stopped, thinking to ourselves that this was an experienced dynamiter; we must be safe here if he thinks sothat was our second mistake. Barn! It sent off, blotting the sky with smoke and dust. We were thinking, “Well, that’s not so bad;” when suddenly we found ourselves in the midst of a shower of smoking rock fragments, some big enough and sharp enough to have beheaded any one of us. “Hmm,” our philosophic friend the dynamiter mumbled. “They couldn’t have been as bad as I thought they were.” Indeed they weren’t! For about 400 feet the other way, the 60 foot high coal-dock roof had suffered a four-foot diameter hole from our dynamiter’s “fragments.” We spotted the yard engineer below it. The brakie’s derby hat had also blown off revealing his balding pate. One of the tasks assigned to us concerned an alternative source of water supply for possible development in the new town site. It was necessary to run a line of levels from the mouth of a watercourse south of Churchill called Goose Creek. John Norquay and I took off one cool morning in either September or October to attend to this. We were given a ride down to Goose Creek’s crossing of the railway by a friendly gas car operator. This area of Churchill is very close to the tree line. We planned to walk alongside the creek to its mouth several miles away. It angled rather sharply to the southwest. The trees there were small, few thicker than one’s finger, but they grew so closely together, we could not get our feet down on the ground. We pushed our way into this formidable growth, but making little or no progress we took to the creek and waded along its slippery stone bed to the Churchill River. My recollection is that we arrived there about 2 p.m., having been more than six hours on the way. We were now in a sort of no-man’s-landa reedy, swampy area with a few clumps of small willows. Even had we started back the way we had come, it would have been midnight by the time we returned to Churchill. So we began surveying our line of levels as soon as we had eaten our lunch, knowing that we were finally headed in the right direction. We plowed along the swampy shore until it became too dark to read the rod at any distance. Then we picked out a friendly looking clump of reeds and huddled together to begin one of the longest nights of my life. I cannot recall the temperature, but I believe it was close to freezing. Neither of us got any restful sleep, as we had nothing to keep us warm but the light parkas we were wearing. We shivered through the darkness, hour after hour, and at daybreak we were glad to arise and continue our levelling towards the elevator, which soon came into view. We had been fortunate in evading both wind and rain during this period, and reached Churchill just in time for the noon meal, one of the most satisfying I have ever enjoyed. Our boss had another job lined up for us that afternoon. But we could not hear what he was saying and fell into our beds and a long, much-needed rest that lasted till breakfast time next morning. Churchill at this time abounded with “characters.” Among these, one of the most popular was the United Church missionary, Rev. Sam Martina typical middle-aged well-upholstered Ontarian. He had a little edifice at the north end of the settlement, not far distant from the Signal Corps radio station and the R.C.M.P., in which he held church services hopeful of converting some of the sinners who enjoyed only too well being corrupted by the evils of bootleggers and the favors of the painted ladies of ill-fame. They were not permitted to occupy premises within the community, so that the R.C.M.P. was responsible for the growth of an enormous trans-river water taxi service which became big business on a Saturday night. The boatmen charged $2.00 each way, and I was told that the girls charged another $5.00 or $10.00, depending upon the sobriety of their clients. They occupied tents and had come to Churchill from Gillam by canoe with a cargo of liquor. Web-fingered Alice was the most popular. Sam Martin seemed to fight a losing battle for the morals of these hard-bitten construction workers, but he had another interest in life connected with the history of Churchill. He had read of the adventures and tragedies of Jens Munck, the Danish explorer, and his story apparently fascinated Martin. He, therefore, set for himself the task of searching the western shore of the Churchill River in an effort to locate evidence of this occupancy by Munck in the years 1619 and 1620. Apparently Sam made many visits along the western shores, apparently without success. It remained for modern Danish archaeologists to find the place, marked by graves, together with an amazing collection of artifacts. One of the most newsworthy events that marked the year 1931 at Churchill was the arrival of Colonel Charles A. Lindbergh and his wife, Anne, for a brief stopover on their honeymoon flight to the Orient. In North to the Orient (1935, p. 254), Mrs. Lindbergh records their arrival at Churchill at 23:50 hours on 2 August, and their departure the next day at 18:47 hours, G.M.T., which times would correspond with 17:50 and 12:47 hours C.S.T. Nan Shipley, in her book on Churchill added that the couple was greeted by a large crowd on their arrival, and were toured around by a committee of eleven white women who were the wives of local officials. Mrs. Lindbergh neglected to describe their stopover at Churchill. Charles and Anne Lindbergh at Churchill, 1931. There was no sumptuous accommodation to extend to the Lindberghs. They were given the best lodging available at that time, which was in the staff-house of the Department of Railways and Canals, a little wooden structure built on the rocky bank of the Churchill River some distance north of the huge grain elevator. Here, too, sanitary facilities were primitive, the most popular of which was a one-hole backhouse, approached directly from the rear of the staff-house by a wooden catwalk. One of my classmates from the University of Manitoba gained everlasting fame that day. He was surveying in the neighborhood when he noticed Mrs. Lindbergh strolling out of the staff-house along the cat-walk that led to the latrine. It had been built to accommodate the important dignitaries living in the staff house. My friend, a Scottish immigrant who gloried in the nickname of “Scotty,” also noticed Mrs. Lindbergh’s return to the staff-house, after presumably completing her business satisfactorily. Few would have recognized the golden opportunity for fame that Scotty saw immediately. He stopped his surveying and shamelessly made a bee-line for the biffie. Forever afterwards he boasted that he had occupied that backhouse immediately after Mrs. Lindbergh. And, what’s more, he did so while the seat was still warm! The year 1931 marked the completion of the Canadian Northern Railway to the station and yards at Churchill, though the line had actually reached the port in 1929. Aboard its “Muskeg Limited” came the swarms of men that were to build the port and its two and a half million bushel grain elevator. Some of the equipment and materials were also shipped by rail for construction of the elevator by the Winnipeg consortium of Carter, Halls, Aldinger. By 1931, docks had been built and the port was ready to operate. The elevator lay north of the railway station and its roundhouse, with a small switching yard in between. The rail line was extended through the elevator’s dumpers from which the grain could be emptied from the boxcars that were used to haul the grain. The elevator was being filled with grain when the first freighter arrived to dock alongside. It was called the Warkworth, a vessel of the Dalgleish Shipping Co. of Newcastle-on-Tyne, so many of whose sister ships would follow in her wake, across Hudson Bay to the Port of Churchill. The sight of this 10,000 ton ocean freighter held the greatest fascination for Jack Edwards and I who, being just a couple of prairie flowers, had never before beheld anything like it. We could hardly wait for our free Sunday to give the ship our inspection. A channel had been dredged from the dockside about thirty-two feet deep which, with the high tide of about fifteen feet, allowed a clear draft of around seventeen feet for the loaded vessels. As I stood there, my mind reverted to the only ship I had known anything aboutthe Saturnia. I remembered that the Captain was on the top deck, where he steered the ship. It puzzled me why we were in the section of the ship called the steerage. Jack and I gaped at this great wonder. Being a Sunday, all the ship’s officers and crew were off carousing or sleeping off a hangover. But there was one lone body aboard and he came over to talk to us. His name was Joseph Robson and he came from Newcastle-on-Tyne. Now, Joseph Robson is a Churchillian name. That was the name of the engineer who had been one of the builders of Prince of Wales’ Fort, the great stone structure that marks the western entrance to the harbor. The man who I am about to describe lived over two centuries ago, and was probably an ancestor of the namesake to whom we are speaking aboard ship. Joseph Robson was the name of a stonemason who first came to Churchill in August of 1733. He considered himself (probably rightly) the only man capable of building the new fort but his attempts to assume that post of project manager were frustrated by the then governor of the fortRichard Nortonwho made his point with a horsewhip in hand. Joseph Robson published one of the classics concerning the early days at Churchill. He entitled it: An Account of Six Years’ Residence in Hudson’s Bay from 1733 to 1736 and 1744 to 1747 containing a Variety of Facts, Observations, Discoveries Tending to Show the Vast Importance of the Countries about Hudson’s Bay Improvements that may be made there in Many Beneficial Articles of Commerce, Particularly in the Furs and in the Whale and Seal Fisheries, and the Interested Views of the Hudson’s Bay Company, (London, 1752). His title closely describes the contents of the book, which is extremely critical of the Company’s failure to encourage enterprise and development. Robson was a native of Newcastle-on-Tyne. It was something of a coincidence to discover therefore that the Chief Engineer of the Warkworth bore the same name as this rather ancient engineer who acted as foreman of a construction crew of 40 or 50 men. Our Warkworth Robson was casually interested in being told of the eighteenth century Newcastle builder, but simply commented that there had been engineers in the Robson family for hundreds of years. Our newfound Joseph Robson took great pride in showing a couple of prairie landlubbers around his ship, educating us in marine terminology. He said they didn’t call the front and back of the Warkworth her sharp and blunt ends, but rather they were the bow and the stern. He went on to explain that the cookhouse was called the galley, that stairways were companionways, that the floor was the deck, the walls were bulkheads, his room was his cabin, his bed his bunk, the clothing store was called slops, and a dining room was a mess. There were many other terms that I have long forgotten now. He opened a door on the deck which led down a long and steep iron-grilled companionway into the very bowels of the shipwhich was his pride and joy as chief engineer of the ship; for this was his engine room, filled with immaculately gleaming and sparkling machinery. He described it all to us, which was of particular interest to me. I wrote a long letter to my father at this time, repeating everything I had learned in the several hours aboard the Warkworth, and though I’m certain I still have that letter (which was returned to me in later years), I have been unable to lay my hands upon it. Many ocean-going vessels were idle at this time, and many “bottoms” were laid-up, so that wages were very low. I was being paid $125 per month, and had little idea whether I was being well or poorly compensated until I talked to Robson. He was in charge of this vast outlay of expensive machinery, and was to be responsible for driving the ship and its cargo of grain across the Atlantic for a pitiful $85 per month. I could barely comprehend this. Of course, his pay was all foundhe was provided with accommodation and meals. In addition, he was also free to make whatever purchases he wished from the ship’s storesall duty free. He took Jack and I along to his cabin and gave us a sample of fine scotch whisky (duty-free) that had cost him only fifty or seventy-five cents for the bottle80% less than it cost in Manitoba. While the three of us sat chatting in his tidy little cabin, preparing to leave the ship, he pulled out his tin locker from below his bunk and gave each of us a tin of Capstan tobaccoa brand normally too expensive for us to purchase, which we enjoyed later in our pipes. The loading of the ship continued over the next few days, the grain being elevated from its massive cylindrical concrete bins, rising 100 feet above ground level. By systems of conveyor belts and piping it was led to the dockside and then poured along a metal chute into the hold of the ship. It was fascinating to watch the cargo grow by this stream of grain until the ship was fully loaded with about a third of a million bushels of wheat. In those days of steam locomotives, boxcars carried about thirty tons each, and a train was no more than thirty or forty cars, so that a trainload hauled about a thousand tons of grain. It took ten trainloads to fill the Warkworth. While the Warkworth lay at the dockside loading, she was joined by her sister shipthe Farnsworth, and the two lay alongside each other for a day or two. Everything was ship-shape aboard these freighters of the Dalgleish line. Their paint was fresh and thorough. One by one, they sailed away, reaching their British ports without adventure or incident. 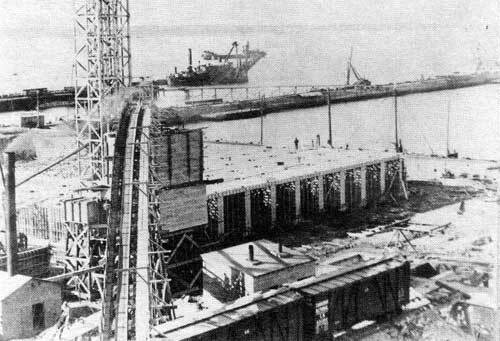 These were the first two vessels to carry grain from the new elevator at Churchill in the year 1931. 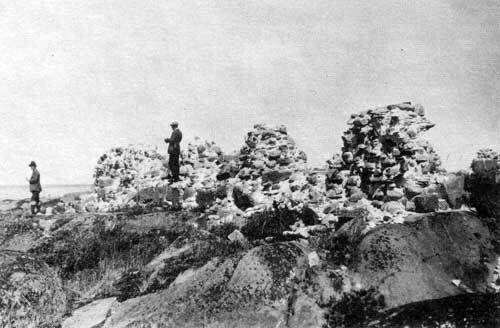 Remains of the stone battery at Cape Merry near Churchill, circa 1930. Built in 1747 by the Hudson’s Bay Company, the battery was reconstructed in 1959.